Our Advanced 10-Person Triage & ICS Base System is the perfect solution for a large scale triage and incident command operation. This advanced system comes with additional communications equipment including two-way radios, a bull horn and a set of triage marking tapes. On the scene of a natural disaster with injuries, response teams need to set up and coordinate quickly to help victims and save lives. 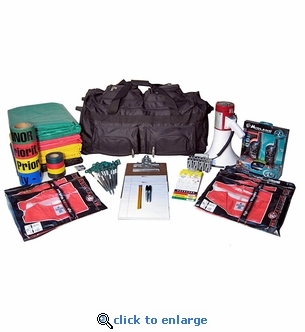 This triage & ICS base system has everything ready to go in a wheeled heavy duty 36" duffle bag. 10 Professional ICS Vests w/ Front and Rear Title Inserts. Pair of Midland 2-Way 22-Mile 22-Channel Radios. 4 AA Cell Industrial Alkaline Batteries. Emergency Bullhorn 50-Watt 765 yd. range. 8 D Cell Industrial Alkaline Batteries. Multiple safety vest colors available. Please call or leave a note in the comments area at checkout.